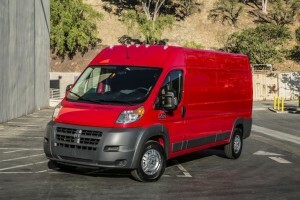 The 2016 RAM ProMaster cargo van is a gamechanger for the Atlanta work force. As a fleet vehicle, the RAM work van is already getting some attention. Late last year, RAM supplied the United States Postal Service (USPS) with 9,000 ’16 ProMasters for their fleet. If such a large government fleet can get behind the ProMaster, maybe it’s time to see how your Atlanta business can benefit from it. The 2016 RAM ProMaster has plenty of best-in-class and class-exclusive features. With the award-winning Pentastar V6 engine, you’ll get best-in-class horsepower of 280 with torque of 260 lb.-ft. When properly equipped, your 2016 RAM ProMaster can tow up to 5,100 pounds or rule the road with a 4,420-pound max payload. The turning diameter is also a best-in-class measurement of 36-feet. If you opt for the 3.0-liter EcoDiesel engine, you can see your oil change intervals increase to up to 18,500 miles — but even when you need service, Atlanta Commercial Trucks will be ready to assist you. Our Atlanta BusinessLink members will get some nifty perks including next-bay service and upfitter and bailment pool connections. Rest easy when loading up your Atlanta work van—the 2016 RAM ProMaster has more than 460 cubic feet of cargo capacity to help your delivery business, catering services or get the equipment to the jobsite. The versatile RAM ProMaster also has an available window van design for any businesses searching for a passenger transport van near Atlanta. A class-exclusive front-wheel drive powertrain means you can tackle the unpredictable weather in hilly areas if needed. The available Parkview rear back-up camera will make parallel parking and backing up to load and unload the van just that much easier. To learn more about the 2016 RAM ProMaster cargo van and what it can do for your business, contact Atlanta Commercial Trucks today online or give us a call at 855-971-9571! Search our Atlanta Commercial Truck inventory today!